The looming $85 billion in spending cuts coupled with new tax increases will slow economic growth considerably this year. But the economy is likely to pick up steam in 2014, pushing unemployment down and setting the stage for a rise in interest rates and inflation. Those are key takeaways from the annual budget and economic outlook released Tuesday by the Congressional Budget Office, the nonpartisan scorekeeper for lawmakers. Deficits: The CBO estimates that this year's deficit will fall to $845 billion, or 5.3% of the size of the economy, in part because of the so-called sequester -- the blunt, automatic spending cuts across defense and nondefense programs set to take effect March 1. If that happens, 2013 would mark the first time since 2008 that the annual deficit comes in below $1 trillion. And the downward trend would continue for the next two years, when the deficit in 2015 falls to 2.4% of GDP. But then deficits would start to go up again. The CBO lays out the reasons -- "an aging population, rising health care costs, an expansion of federal subsidies for health insurance and growing interest payments on the federal debt." Debt: For the decade, the CBO expects the country to add $7 trillion in debt. 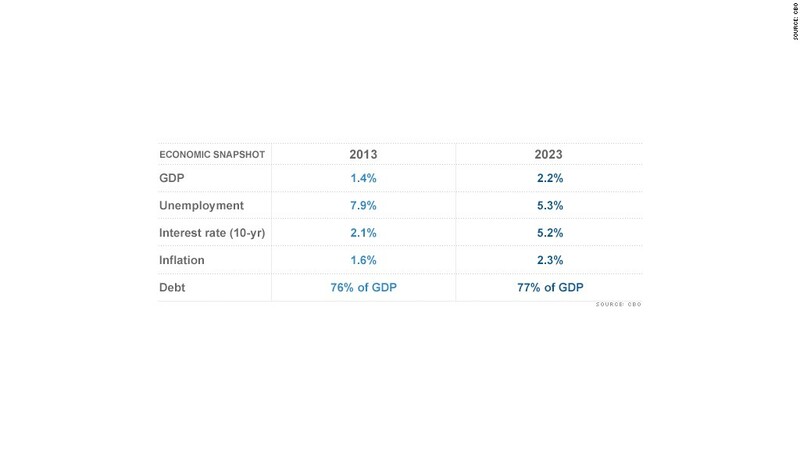 By 2023, the debt held by the public would rise to 77% of GDP up from 76% today. That's the largest percentage since 1950 and almost double the 39% average over the past 40 years. Debt could rise to 87% of GDP by 2023 if Congress makes legislative changes that undo planned spending cuts or tax increases. "We have a large budget imbalance. Small changes will not be sufficient to put the budget on a sustainable path," CBO director Douglas Elmendorf said Tuesday. At the same time, Elmendorf cautioned that trying to reach a balanced budget within the next 10 years would require very large changes to significant parts of the government, even if spending cuts were mixed with revenue increases. Economy: The CBO estimates that the U.S. economy will grow at a slow, inflation-adjusted rate of 1.4% this year. Without this year's fiscal tightening (spending cuts and tax increases combined) growth could have been 1.5 percentage points higher. Among the policies slowing growth are the sequester, the expiration of the payroll tax cut and the higher rates on wealthy households. Unemployment: The CBO expects the unemployment rate will fall from 7.9% this year to 5.3% by 2023. But it won't dip below 7.5% until 2015. "If that happens, 2014 would be the sixth consecutive year with unemployment exceeding 7.5% -- the longest such period in the past 70 years," the CBO report said. Interest costs: The rate on the 10-year Treasury is projected to rise from 1.9% currently to 5.2% by the end of the decade. The expected increase in rates will mean the government will pay more in interest on its debt. Annual interest payments will more than double over the decade, jumping from 1.4% of GDP to 3.3% by 2023, when interest payments will total $857 billion for that year alone. --CNN's Lisa Desjardins contributed to this report.